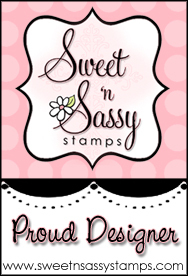 Welcome to the first day of the Sweet 'n Sassy Stamps February release blog hops! 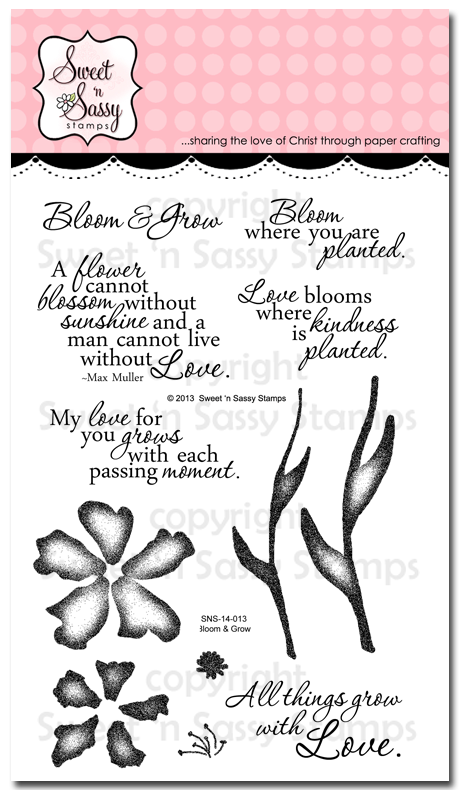 Today, we are showcasing a lovely new stamp set called Bloom & Grow. These flowers are so soft and pretty stamped in colored inks - all giving a taste of spring! 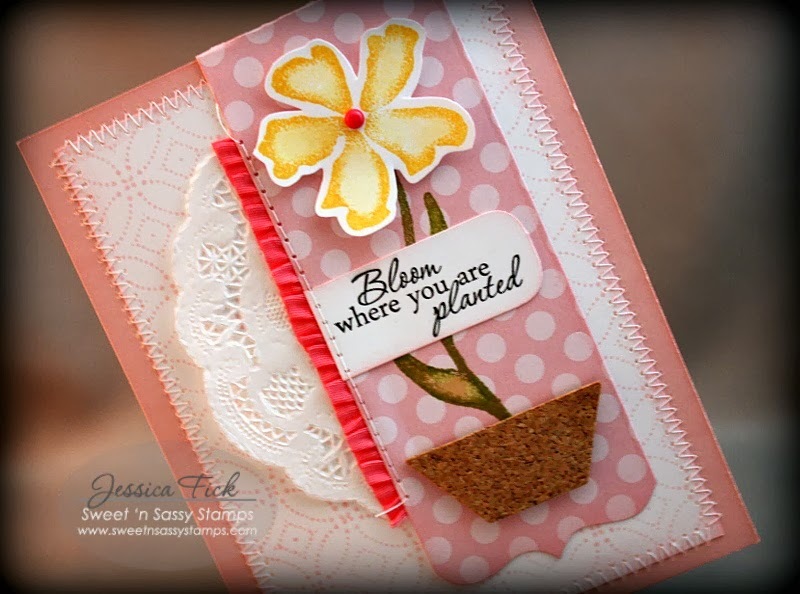 I stamped my stem directly on my banner die cut, cut from one of the bookmark dies in the Bookmarks & More die set - LOVE this particular die and use it often just like this. Then, I stamped the flower on white card stock and used a waterbrush to add a very light touch of yellow to the middle of each petal. The background is another new stamp set this month that you'll be seeing a lot of from me over the next few days because I LOVE it! It's called Delightfully Delicate Background and even though it's a 4" square stamp, Korin has made this image SO easy to line up to easily cover an entire card front. I snuck one more new product on this card - can you see it? I used one of the Shape Up dies for the flower pot! It worked perfectly as a pot cut from cork paper, don't you think? 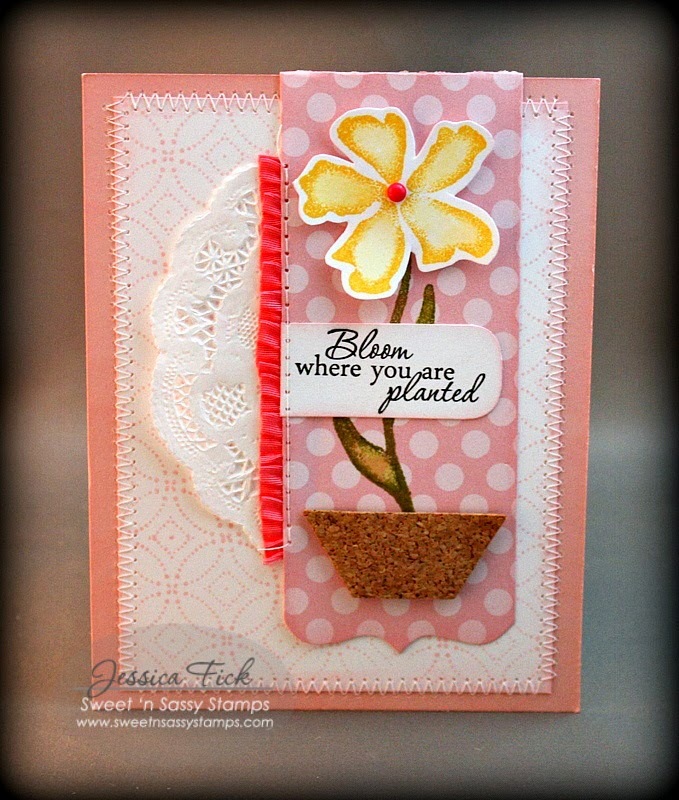 Large Flower Petal image measures approximately 1.5" x 1.5"
Jessica, you always make me smile! Beautifully done, my friend!!! Oh you clever gal, you! The first thing I noticed was the use of the cork, but until I read your comment about using the Shape Up die it didn't dawn on me. What a great idea!! Great card, Jessica! Great card! Love the background stamp. Lovely layered card! I love that background stamp. Great job!!! WOWSERS -- the cork and the stitching on this card are brilliant! Thank you for sharing this wonderful design! I agree with Susie!!! Clever use of die...this is amazing. The background stamp, doily & stitching all make this card so pretty! You are so creative, girl! Look at that cork vase! Wonderful use of the delicate background as well! Gorgeous sample! Hugs! You've used all those new products perfectly! I may just have to order this entire release! Very pretty card...love your placement of the sentiment over the flower stem. Beautiful card, I really do love the versatility of this set. The cork vase is a great idea, Jess! Your card is beautiful. I like this set. Both the graphics and the sentiments are precious. Thanks for sharing your project and thanks also for the giveaway. This is a fun and pretty card. Love the cork pot! What a wonderful card to showcase several of the new releases. I love the use of the cork. Lovely design. I like the colors and the cork pot. I love that you added cork. Anyone would be blessed to receive this card - wonderful job and beautiful colors!! Yes, love the cork pot. And ohhhh the backgrounds. So much gorgeousness. A cute idea and card! Nicely done. Love the "pot" - really pretty card. So pretty! Love that little "pot" and the ruffly ribbon! Your sewing is awesome. Cards with doilies are so pretty and feminine and I just love the idea of a cork flower pot. Beautiful card Jessica - that new set looks gorgeous and that you enjoy it shows in this fabulous card. What a pretty card Jessica. Love the cork pot (such a neat idea) and the stitching! Love the cork flower pot. Great card. the flower stamp is really nice. Your cards are always perfection, Jessica! Love the layers and the stitching is wonderful. This is so pretty! I love everything about it...the hexagon used as a flower pot, how you cut out the flower, the strip of ribbon on the side. Awesome job! Thanks for sharing. Love the stamp set, love your card! So many possibilities, thanks for the great inspiration! Cute card, I like the cork pot! Jessica, cute, cute, cute. Super idea using the cork for the flower pot. TFS! This is super cute! I love the clever use of cork for the flower pot. Thanks for the inspiration. This card is just fabulous! I love everything--the stitching, the doily, the cork flowerpot, and the stamping is wonderful. Thanks so much for sharing your card and technique! Such a sweet, spring card! Very pretty and great use of the cork!